VANKLEEK HILL – As construction on the Higginson Tower nears completion, Ruth Martin has been working on a slightly different aspect of the project. Martin has been collecting information from print sources and first-hand interviews in the hopes of creating an enjoyable account of the history of the Higginson Tower. Along the way, she’s learned a few things about the area. Primarily, she discovered that Thomas Higginson originally built the tower with an intended use as a grist mill. “In the early beginnings of Vankleek Hill, that was an important thing because it (the town) was starting to evolve into the hub of the agricultural community,” Martin said. Yet, the fixed design had a flaw – the tower faced east and Martin said there was never enough wind to turn the blades – and the tower soon fell into disuse. “It was probably used for storage then,” Martin said. She then learned that Thomas Higginson’s son William was the one who turned it into an observatory. However, some people, Martin learned, thought it was the father who turned the mill into an observatory. Nevertheless, according to Martin’s research, both Higginsons did a lot for the town. Thomas also built the Higginson house, which is now used as Arbor Gallery, over a period of seven years. All this, Martin said, she learned from various local books, articles from the National Archives and online. Online, she learned about the Fenian Raids. The Fenians were Irish nationalists who were hoping to use Canada as a bargaining chip against Britain for the liberation of Ireland. This information is being compiled into a booklet and will be used on interpretive panels, one outside and three inside the tower. The results of an investigative archaeological dig, conducted in May 2006 before restoration work began, are also going to be included as exhibits in display cases inside the tower. Martin recently interviewed four townspeople about their memories of the tower, including Champlain Township Mayor Gary Barton. “(He) used to go insode, and by that time there were a number of steps missing and you’d jump two or three steps up to the next one, and he knew he wasn’t supposed to be there,” Martin said. Thelma MacCaskill was also interviewed by Martin, and she recounted re-enacting fairytales with friends during her childhood. “She talked about how much fun it was,” Martin said. The interviews are going to be part of an audio tour when the tower is open to the public. An audio script with fictional historical re-enactments using with local residents playing the roles of historical characters is also in the works. Martin has been hard at work for about two weeks and her deadline is fast approaching. The interpretive program is being developed thanks to a $9,900 Local Initiative grant received from the Prescott-Russell Community Development Corporation (Community Futures). 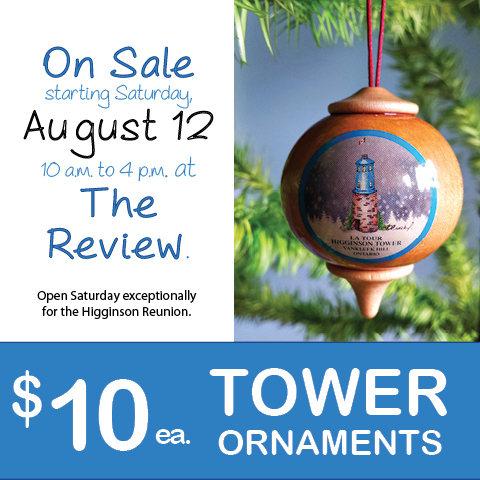 The Higginson Tower Committee has raised about $101,000 for restoration of the 175-year-old Higginson Tower and has received about $80,000 in funding from various sources, including the Ontario Trillium Foundation, the Prescott-Russell Community Development Corporation (Community Futures) and Champlain Township. Many “in-kind” services have helped to move the project forward since fundraising began in earnest in February 2006. Embossed tin for the wooden portion of the tower is expected next week; installation of the tin should begin shortly. The wooden portions of the tower will be lifted onto the stone tower base with the help of a crane before the ground thaws, according to the committee., which plans to have the tower open seven days a week as a heritage tourist destination this summer.